“Small Pleasures” is designed for the facade of the Ulrich Museum of Art (Wichita, KS) in place of Joan Miro’s monumental mosaic Personnages Oiseaux. Miro’s mural is under restoration from 2012 through 2016, which is the duration of this project. 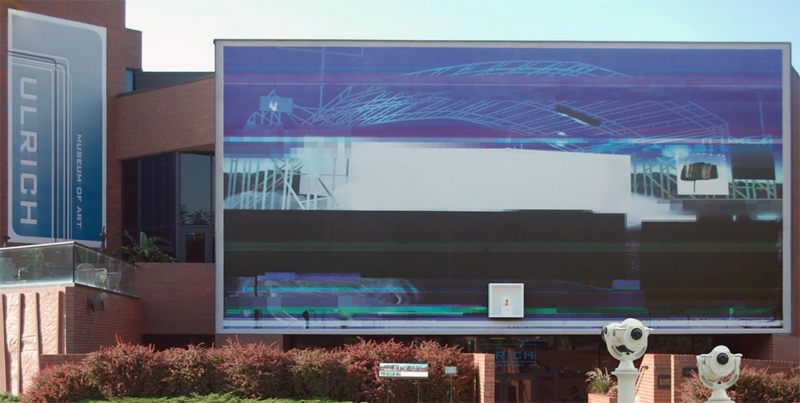 The installation consists of a pixelated print on a billboard-sized banner covering the facade, a small waterproof display case mounted in the middle of the banner, and two telescopes installed across the street for the viewing of miniature works displayed in the case. In addition to a small work displayed in the case, many of Rushin’s paintings will be suspended from the billboard itself.